Definition at line 26 of file Parser.h. Definition at line 29 of file Parser.h. Definition at line 46 of file Parser.h. 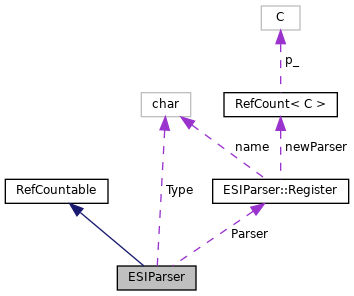 Referenced by ESIContext::parseOneBuffer(), and ESIContext::parserComment(). Definition at line 19 of file Parser.cc. Referenced by NewParser(), ESIParser::Register::Register(), and ESIParser::Register::~Register(). Definition at line 26 of file Parser.cc. References fatal(), GetRegistry(), NULL, and p.
Referenced by ESIContext::ParserState::init(), and ESIContext::parserComment().